Two DAS-class storm cutters engaging a Gladius-class corvette over New Carthage. New Carthage is a human colony planet of the Unified Earth Government, located among the Inner Colonies. The MJOLNIR Powered Assault Armor/Infiltrator, developed by Hannibal Weapon Systems, was tested on the orbital defense platforms above New Carthage. The Hannibal Weapon Systems facility also developed multiple MJOLNIR Powered Assault Armor variants at Kotka, Pori on New Carthage. New Carthage is host to the New Carthage Sprint Series, a competitive motorsport event that features the colony's deadly wildlife, rugged terrain, heavy weapons, and talented driving skill. The Great red shark is an indigenous species native to the planet. New Carthage is the homeworld of Dr. Henry Glassman. 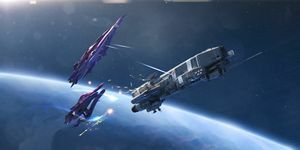 In 2554, two DAS-class storm cutters, Mark of Prophecy and Divine Breath, were being used by Kig-Yar engaged in smuggling and piracy near New Carthage. The two ships had a deadly encounter with the Gladius-class corvette UNSC Sagan Blue. At some point a thermal reactor located underneath the city of Pilvros was failing, and as a result the city was evacuated. The planet is named after the ancient city of Carthage. Hannibal Weapon Systems is named in reference to Hannibal, an infamous Carthaginian general who is considered to be one of the greatest military leaders in history. ↑ Halo Mythos, page ?? ?